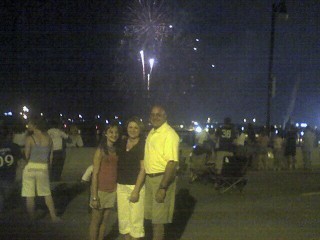 The Cannon Family (with the exception of Tyler which was hanging out with friends) along with our "small group" celebrated our independence by attending the fireworks in St. Louis. We were standing on the Eads Bridge over the Mississippi River watching the fireworks by the Arch. They were spectacular! Freedom! The good ole USA just celebrated 230 years of freedom, but that freedom did not come cheap. Our military men and women have committed their lives, made tremendous sacrifices, and many have even shed their lives blood just so we could be free. Living just outside of Scott AFB has given me a completely renewed appreciation for our military members. These families are great. They are inspiring, courageous, extremely patriotic, and many of them have a very strong faith in their Lord (Jesus Christ). To all military persons and family members that may be reading this, let me say 'thank you for giving your life to protect our freedom; family members, thank you for the sacrifices you have made that most Americans are clueless about' -- you guys are awesome! There is another freedom we are celebrating--over 2000 years of spiritual freedom! The one Person I would like to commit about that gave His life for our freedom is Jesus Christ. He shed His blood, gave His life on the cross, took our sins upon Himself, died, was buried, and after three days rose again...all so we could be spiritually free! Do you know Him? Do you have a personal relationship with Him? Have you asked Him into your life? If not, why not pray this prayer, "Dear Lord, I believe you died for me, was buried and rose again. Right now I ask you to forgive me of my sins, come into my life and be my Lord and Savior. Amen." If you just prayed that prayer please contact me.